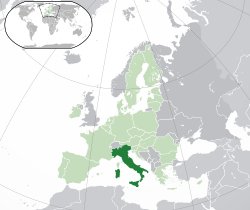 Rwiyo: Il Canto degli Italiani, "The Song of the Italians"
Italy (/ˈɪtəli/; muChiItalian: Italia [iˈtaːlja]) inyika iri muEurope. Nyika iyi ine miganhu neSwitzerland, France, Slovenia, Vatican City, San Marino neAustria. This page was last edited on 23 Chikunguru 2017, at 02:14.